Once man had the idea that our Sun was just one of the many stars in the sky, there was speculation that these suns, too, should have planets, and these planets might also be the abode of men. It was an even shorter leap to speculate that the Moon and the planets of our Solar System could harbor extraterrestrial life. Cover of Johannes Kepler's science fiction novel, Somnium. Since Kepler could not imagine any physical way of reaching the Moon, it's described to him by a daemon. It was revealed that daemons could at times transport humans to the Moon, which was said to be just 50,000 miles distant from the Earth in the story (it's actually about 240,000 miles). Humans could breathe on the moon through damp sponges, but the daemons must protect them from the cold. Frontispiece of the 1659 German edition of The Man in the Moone by Francis Godwin (1562-1633), who was a bishop of the Church of England. The unintentional astronaut of this book ascends to the Moon through the help of a group of wild swans after a journey of twelve days. The inhabitants of the Moon lived in a utopian society. After six months on the Moon, Godwin's astronaut becomes homesick for Earth, and he returns, landing in China. In the Space Age, our expectations for life on the planets of our Solar System are more modest. We're looking for living or fossil microorganisms. Our first search for life on another planet occurred as early as 1976 on Mars with the biological experiments of the Viking Landers. Their Labeled Release Experiment was designed to look for the byproducts of metabolism, specifically carbon dioxide gas. A Martian soil sample was moistened with radioactively-tagged nutrients, and a rapid emission of radioactive carbon dioxide gas was detected. However, the scientific consensus is that superoxides in the Martian soil produced the carbon dioxide through a chemical reaction, only, and the experimental results have been replicated using titanium dioxide saturated with hydrogen peroxide. 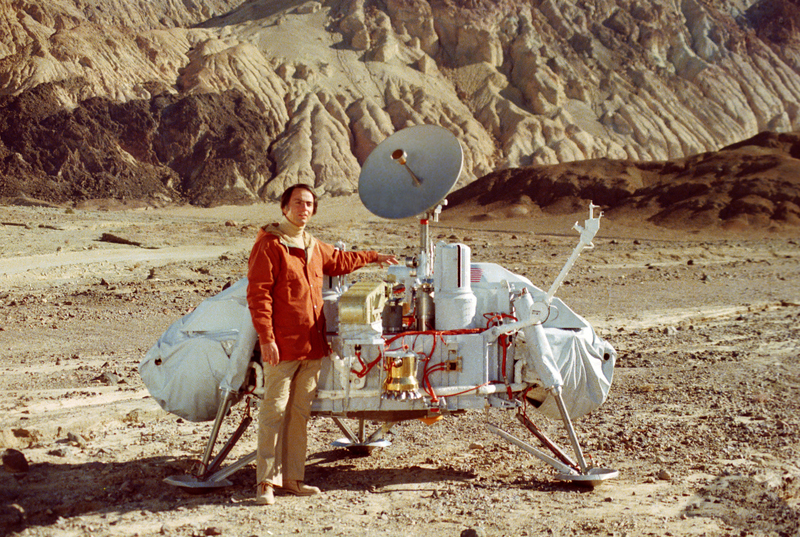 Carl Sagan (1934-1996), posing with a model of the Viking Lander in Death Valley, California. Sagan, one of the first popularizers of science on television with his Cosmos television series, was famously denied membership in the National Academy of Sciences. However, he was awarded its 1994 Public Welfare Medal "For his ability to communicate the wonder and importance of science..."
While the probability of extant life on Mars is low, there are other places in our Solar System that might harbor life. The most promising of these are moons of Jupiter and Saturn. Jupiter's moon, Europa, might have a vast ocean contained beneath a thermally insulating layer of ice. Enceladus, a moon of Saturn, may also have an ocean of liquid water, heated by gravitational interaction with Saturn and insulated by ice. Titan, another moon of Saturn, has cold, hydrocarbon lakes on its surface. Two other moons of Jupiter, Callisto and Ganymede, may have oceans insulated by rock. While great effort is required to visit these natural satellites of the planets of our Solar System, it's far easier to acquire data by telescopic examination of exoplanets. A biosignature is any observed substance that provides evidence of past or present life on a planet. When looking at planets at a distance, a guiding principle would be to determine what could be observed from Earth from a distant vantage point that would signal the presence of life. Obvious examples of Earth's biosignature would be complex organic molecules and certain gases, such as oxygen, in the atmosphere, and things like photosynthetic pigments. Biosignatures would also include unusual isotopic ratios, and seasonal changes in surface features. Evidence of technological materials and structures would definitely qualify. "This idea of looking for atmospheric oxygen as a biosignature has been around for a long time. And it's a good strategy - It's very hard to make much oxygen without life... But we don't want to put all our eggs in one basket. Even if life is common in the cosmos, we have no idea if it will be life that makes oxygen. The biochemistry of oxygen production is very complex and could be quite rare." Life was present on the early Earth, in the Archean and Proterozoic eons, but the gases present would have been mostly methane and carbon dioxide. The study concludes that life could have been detected on the early Earth by the coexistence of O2, N2, and liquid water. In the Archean, the coexistence of N2, CH4, CO2, and liquid water would have signaled life. While methane might be produced by asteroid impacts, reactions of rocks and water, and volcanic outgassing, the authors conclude that it would be hard to produce a lot of methane on a rocky, Earth-like planet except by the activity of living organisms. Essentially, if methane and carbon dioxide are simultaneously detected, especially without carbon monoxide, that's a rather conclusive biosignature. Says Krissansen-Totton, "... planets with volcanoes that belch out carbon dioxide and methane will also tend to belch out carbon monoxide." Carbon dioxide concentration will be small in a living planet, since the gas is readily metabolized by microorganisms, and the presence of a lot of carbon monoxide signals a non-living planet. The conclusion of the study is that methane is a more common biosignature than oxygen, and simultaneous detection of abundant CH4 and CO2, coincident with the absence of abundant CO, is a useful biosignature. [7-8] The research was funded by NASA. Ron Miller, "Early Ideas About Extraterrestrial Life: What Might Inhabitants from Other Planets Look Like?" ancient-origins.net, November, 17, 2017. Ron Miller, "Aliens: The Complete History of Extra Terrestrials: From Ancient Times to Ridley Scott," Watkins Publishing (October 17, 2017), 240 pp., ISBN-13: 978-1780289687 (via Amazon). Monty Python - Unladend Swallow, YouTube Video by Weidmoo, May 12, 2012. Monty Python and the Holy Grail - The Bridge of Death, YouTube Video by FDUK200K, August 18, 2008. Defining Life, Astrobiology Magazine, June 19, 2002. Richard C. Quinn and Aaron P. Zent, "Peroxide-Modified Titanium Dioxide: a Chemical Analog of Putative Martian Soil Oxidants," Journal Origins of Life and Evolution of Biospheres, vol. 29, no. 1 (January, 1999), pp. 59-72. doi:10.1023/A:1006506022182. Joshua Krissansen-Totton, Stephanie Olson and David C. Catling, "Disequilibrium biosignatures over Earth history and implications for detecting exoplanet life," Science Advances, vol. 4, no. 1 (January 24, 2018), Document no. eaao5747, DOI: 10.1126/sciadv.aao5747. This is an open access publication with a PDF file available here. Hannah Hickey, "A new 'atmospheric disequilibrium' could help detect life on other planets," University of Washington Press Release, January 24, 2018. Linked Keywords: Human; man; Sun; stars; night sky; speculative reason; speculation; planet; Moon; Solar System; extraterrestrial life; Germany; German; astronomer; Johannes Kepler (1571-1630); paradigm change; paradigm shift; Nicolaus Copernicus (1473-1543); science fiction; novel; Somnium; Charles Darwin; natural selection; adaptation; adapted; hibernation; hibernate; exoskeleton; hard shell; Moon; daemon (classical mythology); mile; Earth; breathing; breath; sponge; Wikimedia Commons; Bernard de Fontenelle (1657-1757); France; French; mathematician; emotion; emotional; environment; Mercury; hot-blooded temperament; Saturn; philosophy; philosophical; book frontispiece; German language; The Man in the Moone; Francis Godwin (1562-1633); bishop; Church of England; astronaut; wild swan; utopia; utopian society; homesickness; homesick; China; synopsis; Monty Python and the Holy Grail; airspeed; swallow; Space Age; fossil; microorganism; Mars; Viking lander biological experiments; Viking Landers; Labeled Release Experiment; byproduct; metabolism; carbon dioxide gas; Martian soil; liquid; moisten; radiochemistry; radioactively-tagged; nutrient; scientific consensus; superoxide; regolith; soil; chemical reaction; experiment; experimental; titanium dioxide; saturation (chemistry); saturated; hydrogen peroxide; Carl Sagan (1934-1996); Death Valley, California; science; television; Cosmos: A Personal Voyage; Cosmos television series; National Academy of Sciences; Public Welfare Medal; probability; habitability of natural satellites; moons of Jupiter and Saturn; Europa; ocean; thermal insulation; thermally insulating; ice; Enceladus; gravitation; gravitational; Titan; hydrocarbon; lake; Callisto; Ganymede; rock; natural satellite; telescope; telescopic; exoplanet; biosignature; organic compound; molecule; gas; oxygen; atmosphere of Earth; photosynthesis; photosynthetic; pigment; isotope; isotopic; ratio; season; seasonal; technology; technological; material; NASA; James Webb Space Telescope; strategy; open-access journal; open access paper; Science Advances; planetary science; planetary scientist; astrobiology; astrobiologist; University of Washington (Seattle, Washington); The University of California-Riverside (Riverside, California); chemical equilibrium; ozone; Joshua Krissansen-Totton; doctoral candidate; author; put all our eggs in one basket; universe; cosmos; biochemistry; Archean; Proterozoic; eon; methane; carbon dioxide; life; asteroid impact; chemical reaction; volcano; volcanic; outgassing; metabolism; metabolize.